Some guy recently posted a strangely self-defeating link/troll/flame in an attempt to (I think) argue with Alex and/or myself regarding the relevance or lack thereof of ISACA’s CRISC certification. Now given that I think he might have been doing it to drive traffic to his CRISC training site, I won’t show him any link love (although I’m guessing he’ll show up in comments and save me the effort). Still, he called my Dad (“Mr. Howell”) out by name, which is a bit cheeky seeing as how my Dad left the mortal coil some time ago, so I’ll respond on Dear ol’ Dad’s behalf. Now the funny thing about that is that I had pretty much forgotten all about CRISC, even though we’ve had a lot of fun with it here at the New School and made what I thought were some very good points about the current lack of maturity in Risk Management and why the last thing we need is another process-centric certification passing itself off as expertise. I went back and re-read the original articles, and I think that they are still spot-on, so I decided that I would instead take another look at CRISC-The-Popularity-Contest and see who has turned out to be right in terms of CRISC’s relevance now that it’s been nine months almost to the day since ISACA announced it. Quick, dear readers, to the GoogleCave! 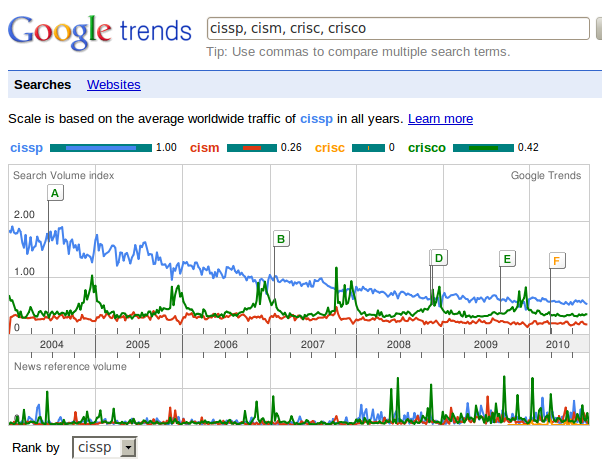 Hmm…CRISC isn’t doing so well in the Long Run. That’s a zero (0) for the big yellow crisc. Of course, in the Long Run, we’re all dead, so maybe I should focus on a shorter time frame. Also, I see that either Crisco’s marketing team only works in the fall or most people only bake around the holidays. If you had asked me, I would not have predicted that Crisco had a strong seasonality to it, so take whatever I say here with a bit of shortening. Let’s try again, this time limiting ourselves to the past 12 months. 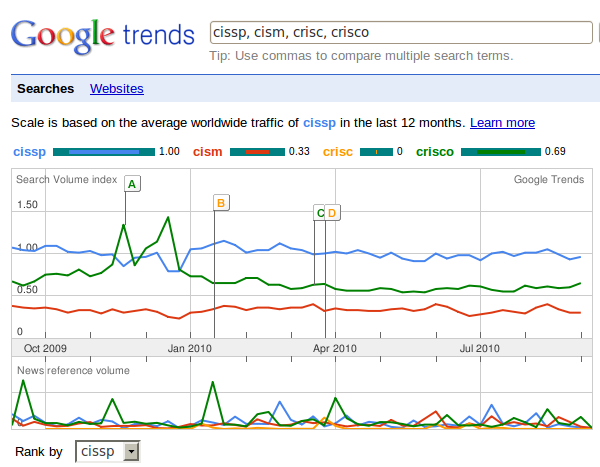 Nope…still nothing, although the decline of the CISSP seems to have flattened out a bit. Also, we can definitely now see the spike in Crisco searches correlating to Thanksgiving and Christmas. Looks like people don’t bake for Halloween (Too bad. Pumpkin bread is yummy) and probably don’t bake well for Thanksgiving and Christmas if they have to google about Crisco. P.S. Yes, I’m aware my screenshots overflow the right margin. No, I’m not going to fix it.